Indulge in tailor-made beauty with Maria Galland Paris' luxurious skin care treatments at Immortelle Atelier, designed to give you the fountain of youth! Pamper yourself with the Maria Galland Luxe Collagen Facial, leaving your skin with a visible youthful radiant glow. Using the most superior products from #MariaGalland, the treatment contributes significantly to reduce wrinkles, regenerate and firm the skin. The extremely concentrated serum provides a tired complexion with optimal energy, while the high-performance concentrate triggers cell renewal and skin regeneration. The Maria Galland Collagen Mask helps fade away wrinkles and expression lines, soothes, firms, regenerates and intensely hydrates the skin. For a youthful look, seek no further as this premium luxury treatment is great for an immediate anti-ageing effect, effectively decreases the wrinkles on the face, as well as eliminates subtler signs of ageing. 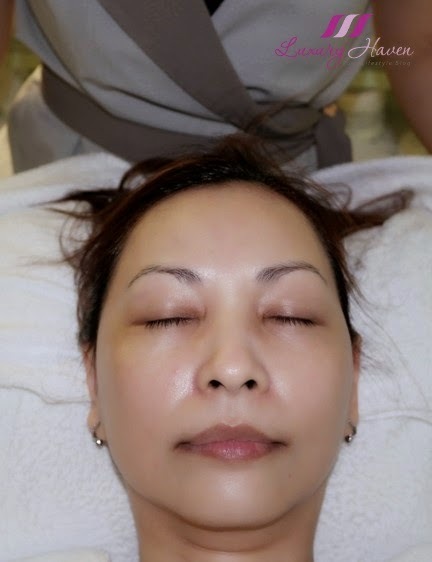 Priced at SGD 188 / 120min, the Maria Galland Luxe Collagen Facial at #ImmortelleAtelier is truly an extraordinary experience, offering optimum radiance to the skin. You are so lucky, I wish I could have a facial, too! Kati, facial is a vital treatment for my age now. Hahaha! Testoland, have a good week! Wow your skin looks flawless we need that service here in USA. Your glowing skin says all about the treatment. Wow your skin is so smooth!! Great facial spa. Diana, that means a lot! Thanks, sweetie! DS, thanks for being such an awesome supporter! WOw Look like a very special treatment! Elisa, love #MariaGalland products! They work wonders! Gabrielle, I certainly need to maintain my "youth" at my age! Hahaha! This sounds so good, Shirley. I could do with such a special treatment myself. Your skin is glowing beautifully. Happy Thanksgiving. Lenya, thank you dear! Happy weekend! You look so relaxed, Shirley. I love this kind of treatments. I met Maria Galland products and treatments 4 years ago.. I think they are great and results too. Dania, I've to admit their products are pretty effective & I love the results! Owh, that sounds like the best treatment ever and I bet its really relaxing! Helen, cool! Will pop by soon, sweetie! You look so calm, it must be soothing! Linda, I was pretty much enjoying myself. Hehe! Jyoti, thanks so much! Happy weekend, dearie! Thank you for sharing this great experice! looks like a fantastic skin treatment! Have a fab weeken my dear! Helena, thanks & you've a fabulous weekend too! Looks good dear, Have a great weekend. Subha, thanks & enjoy your weekend too! sounds like lots of benefits, have a good weekend. Tia, you just gotta experience #mariagalland treatments at least once to know how good they are! Your skin looks so plump and glowing!! Hope you enjoy the facial session! Happy weekend! Mun, thanks & happy weekend to you too! GZ, I'm sure you'll enjoy as much! Chaicy, thanks for coming by & leaving your sweet notes! Happy weekend, sweetie! This facial sounds like a real treat for the skin. Lucky you Shirley! Kenny, hope you've a lovely weekend too! Annick, thanks & following you now too! Happy weekend, dear! Uru, appreciate the lovely note! Have lots of fun baking this weekend! Birdie, so nice to hear that! Thanks, sweetie!